CONDITION: Very Good: lightly read. Even the young know the pain of love. 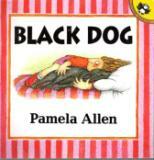 Here we share Black Dog's pain in Pamela Allen's hauntingly beautiful illustrations and simple text - a book that will reach out and touch us all.